¡La segunda semana de Revisión española fue aún mejor que el primer! or The second week of Spanish Review was even better than the first! The students continued to thrill the teachers with their impressive memory recall of the vocabulary learned throughout the entire school year! Continuing on from last week, the students worked on various activity sheets to complete the final few pages in their Libros de Español. Read on below to learn more about what took place during this exciting week! On Monday and Tuesday, the students concentrated on reviewing both the parts of La Cara (face) unit and La Ropa (clothing) unit. In order to complete the activity page for La Cara, the students had to listen to each part as it was said in Spanish and assemble it on their paper. 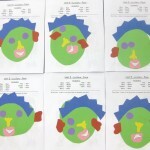 Although the “parts” had been cut out by the teachers in advance and were all the same, the various caras (faces) that were assembled looked quite different. See for yourself below. 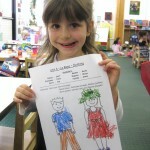 Unlike the faces, La Ropa (clothing) activity pages looked very similar since the students had specific instructions to follow while coloring their page. On Wednesday and Thursday, the students concentrated on reviewing both Los Animales (animals) unit and La Transportación (transportation) unit. Needless to say, these two units were the most popular units of the year. In order to review los animales vocabulary, the students identified different animal homes and had to match the appropriate animal occupant. The only animal dwelling that posed a challenge for the students was the picture of the woods. The students thought of many different animals that could live in the woods before realizing that the answer had to relate to our Spanish vocabulary. Finally, el oso (the bear) made it home and the students moved on to the final page of their Libro de Español. 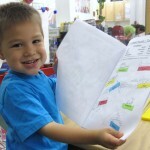 La transportación activity page involved the students matching the various vocabulary words to the pictures. The page itself was by far the least colorful page of all the pages in the books. The students were quite surprised to hear that it would remain blank but then the teachers revealed that the last page was a special one because they could color it while reviewing all of their Spanish vocabulary at home! Wednesday afternoon was a real treat. 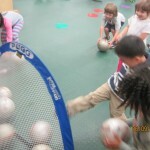 Thanks to a special parent volunteer, the students had the opportunity to learn all about a very popular sport, Soccer! The father pictured below visited Park Prep to teach the students about the sport as well as the World Cup, an international soccer tournament which is currently taking place in South Africa! The students could hardly get enough of the father’s wonderful presentation about soccer but the excitement only grew when he introduced everyone to his very special and SUPER soccer friends. Volunteers from SuperSoccerStars, an organization that runs soccer camps/clinics for children of all ages, visited PPA to help teach soccer skills in a fun, non-competitive way! First, the SuperSoccerStars (SSS) coaches broke up the class into smaller groups and everyone began warming up and stretching. Once the students were ready to begin, the SSS coaches ran the students through a series of agility-building drills similar to an obstacle course! 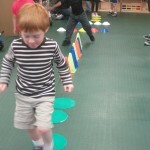 The students were working really hard to jump, skip, hop, and zig-zag through cones placed on the ground. 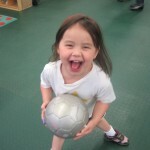 After the students had been worked out, it was time for the soccer balls to come out! 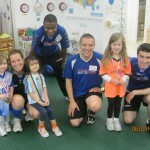 Here are some of the highlights from the soccer day. After an hour of working hard, the SSS coaches called everyone into the middle. Just when the students thought the day could not possibly get any better, the visiting father took out a box of medals – one for each student! Watch below to see one student receiving his medal and high-fiving all of the SSS coaching staff! What a wonderful afternoon! A special thank you to our visiting father for helping organize such a wonderful day and of course, to all of the SSS coaches that helped make Wednesday so much fun! We hope to see you all again soon! 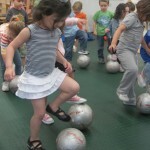 We’re sure that some of the Park Prep Super Stars will become Soccer Super Stars soon! 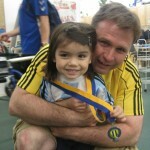 For more information on the SuperSoccerStars, please visit their website: http://www.supersoccerstars.com/. Friday wrapped up Spanish Review Week – Part Dos. In order to celebrate the completion of their Libros de Español, the students spent the morning playing various games in Español! The teachers took traditional games and put a Spanish spin on them! Games such as Hot Potato were turned into Papa Caliente as the students passed around a papa while listening to music. The game became really silly when different foods were taken out of the play kitchen to make it Pollo Caliente (Hot Chicken) or Pan Caliente (Hot Bread). 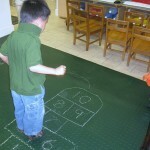 Hopscotch helped with number practice, and Simon Says helped to review la ropa (clothing) and la cara (face) vocabulary. The afternoon was spent crafting a very special thank you card for our soccer friends and celebrating a friend’s fourth birthday! Well, that is all for Spanish Review Week – Part Dos! As always, thanks for reading and see you next week!